Stokesay Castle was built in the 1280s and 1290s in the village of Stokesay by Laurence of Ludlow, a very wealthy wool merchant. Stokesay took its name from the Anglo-Saxon word stoches, meaning cattle farm, and the surname of the de Says family, who had held the land from the beginning of the 12th century onwards. In 1241, Hugh de Say sold Stokesay to John de Verdon; John then left for the Eighth Crusade in 1270, mortgaging the land on a life-time lease to Philip de Whichcote. John died in 1274, leaving his rights to the property to his son, Theobald. Laurence bought Stokesay from Theobald and Philip in 1281, possibly for around £266, which he could easily have afforded, as he had made a fortune from the wool trade. Laurence exported wool from the Welsh Marches, travelling across Europe to negotiate sales, and maintaining offices in Shrewsbury and London. He had become the most important wool merchant in England, helping to set government trade policies and lending money to the major nobility. Stokesay Castle would form a secure personal home for Laurence, well-positioned close to his other business operations in the region. It was also intended to be used as a commercial estate, as it was worth around £26 a year, with 120 acres of agricultural land, 6 acres of meadows, an expanse of woodland, along with watermills and a dovecote. Work began on the castle at some point after 1285, and Laurence moved into his new property in the early 1290s. The castle was, as Nigel Pounds describes it, "both pretentious and comfortable", initially comprising living accommodation and a tower to the north. In 1291 Laurence received permission from the King to fortify his castle - a document called a licence to crenellate - and he may have used this authority to construct the southern tower, which had a particularly martial appearance and was added onto the castle shortly afterwards. In November 1294 Laurence was drowned at sea off the south of England, and his son, William, may have finished some of the final work on Stokesay. His descendants, who took the Ludlow surname, continued to control Stokesay Castle until the end of the 15th century, when it passed into the Vernon family by marriage. Stokesay Castle was passed by Thomas Vernon to his grandson Henry Vernon in 1563. The family had hopes of becoming members of the peerage and, possibly as a consequence, the property began to be regularly called a "castle" for the first time during this period. 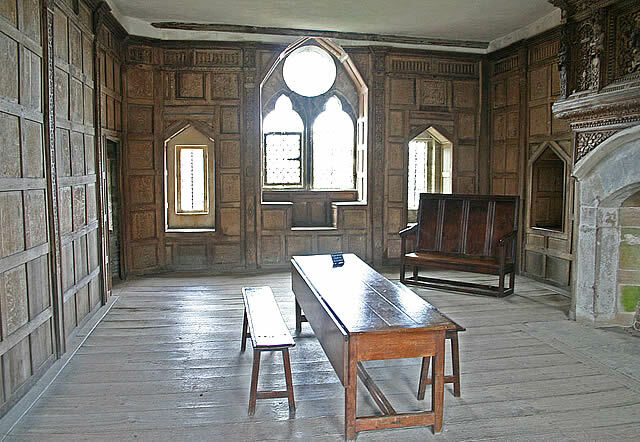 Henry divided his time between London and Stokesay, probably staying in the north tower. Henry stood surety for an associate's debts and when they defaulted, he was pursued for this money, resulting in a period of imprisonment in Fleet Prison; by 1598 he sold the castle for £6,000 to pay off his own substantial debts. The new owner, Sir George Mainwaring, sold the property on again in 1620, via a consortium of investors, to the wealthy widow and former Mayoress of London, Dame Elizabeth Craven for £13,500. The estates around Stokesay were now valuable, bringing in over £300 a year in income. Elizabeth's son, William, spent little time at Stokesay and by the 1640s had leased it out to Charles Baldwyn, and his son Samuel. He rebuilt the gatehouse during 1640 and 1641, however. In 1643 the English Civil War broke out between the supporters of King Charles I and Parliament. A Royalist supporter, William spent the war years at Elizabeth Stuart's court at the Hague, and gave large sums of money to the King's war effort. William installed a garrison in the castle, where the Baldwins were also strong Royalists, and, as the conflict progressed, the county of Shropshire became increasingly Royalist in sympathies. Despite this, by late 1644 bands of vigilante clubmen had risen up in Shropshire, complaining about the activities of Royalist forces in the region, and demanding, among other things, the removal of the garrison from Stokesay Castle. By early 1645 the war had turned decisively against the King, and in February, Parliamentary forces seized the city of Shrewsbury. This exposed the rest of the region to attack, and in June a force of 800 Parliamentary soldiers pushed south towards Ludlow, attacking Stokesay en route. The Royalist garrison, led by Captain Daurett, was heavily outnumbered and it would have been impossible for them to effectively defend the new gatehouse, which was essentially ornamental. Nonetheless, both sides complied with the protocols of warfare at the time, resulting in a bloodless victory for the Parliamentary force: the besiegers demanded that the garrison surrender, the garrison refused, the attackers demanded a surrender for a second time, and this time the garrison were able to give up the castle with dignity. 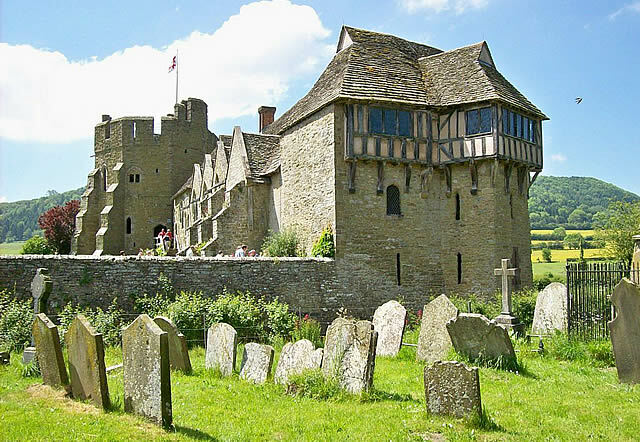 Unlike many castles in England which were deliberately seriously damaged, or slighted, to put them beyond military use, Stokesay escaped substantial harm after the war. Parliament sequestrated the property from William and ordered the slighting of the castle in 1647, but only pulled down the castle's curtain wall, leaving the rest of the complex intact. Samuel returned in 1649 to continue to rent the castle during the years of the Commonwealth, and put in wood panelling and new windows into parts of the property. With the restoration of Charles II to the throne in 1660, William's lands were returned to him, and the Baldwyns continued to lease Stokesay Castle from him. Restoration work was carried out in the 1830s by William Craven, the Earl of Craven.This was a deliberate attempt at conserving the existing building, rather than rebuilding it, and was a very unusual approach at this time. By 1845, stone buttresses and pillars had been added to support parts of the hall and its roof. Research by Thomas Turner was published in 1851, outlining the history of the castle. Frances Stackhouse Acton, a local landowner, took a particular interest in the castle, and in 1853 convinced William to carry out further repair work on the castle, under her supervision, at a cost of £103. In 1869 the Craven estate, 5,200 acres in size but by now heavily mortgaged, was purchased by John Derby Allcroft for £215,000. Allcroft was the head of Dents, a major glove manufacturer, through which he had become extremely wealthy. The estate included Stokesay Castle, where from around 1875 onwards Allcroft undertook extensive restoration work over several years. Stokesay was in serious need of repairs: the visiting writer Henry James noted in 1877 that the property was in "a state of extreme decay". Allcroft attempted what the archaeologist Gill Chitty has described as a "simple and unaffected" programme of work, which generally attempting to avoid excessive intervention. Assistance Dogs are welcome. There is Limited access for wheelchair users, due to the many staircases. No ramps or lifts. Not accessible for motorised scooters. Manual wheelchair users are advised to bring an assistant, and you may need to be able to leave the wheelchair briefly. No artificial lighting inside, except for one light in the cellar. There are accessible toilets and the grounds have good firm surfaces. Transport: Craven Arms (National Rail) 16 minutes. Bus Routes : Minsterley Motors (of Stiperstones) 435 to Stokesay.